Me gustaría probarlos, me da que han de estar muy buenos, aunque seguro que también llenan mucho. Estas recetas tan familiares, hechas entre todos siempre quedan en el recuerdo. Nah, no llenan tanto. Te comes dos como si nada. Y si es con una cervecita ni te cuento, Ana. hola yo pienso hacer tamales para el dia del pavo pero medio por moler el maiz y los demas ingredientes pero no los quiero poner en la oja hasta el dia del pavo , mi pregunta es , si yo no pongo el maiz en la oja ahora como muchos hacer se me va a hechar a perder el maiz molido ? Perdona que hasta ahora es que veo tu pregunta. Si los armas con antelación es mejor congelarlos porque el maíz es muy sensible y se pone malo con facilidad. Se pueden congelar antes de cocinarlos y duran meses, yo aprendí que a los Talluyos ( tamal sin crane como se les llama en La Habana ) se les pone en el sofrito una pizca de comino. Me encantan pero hechos con maiz criollo no dulce. Y siempre me los como con una malta Hatuey de acompañamineto como lo hacía en Cuba cunado era niño antes del desatre del 59. Verdad que sí. En casa también los congelaban crudos. Yo no lo hago mucho porque a veces compro el maíz congelado y ya no puedo descongelarlo y volverlo a congelar. El comino le debe quedar rico. Isbel en Navidad le puso al mojo de la yuca y quedó rico cantidad. Yo lo adoro. De maíz dulce nada y talluyos nunca me he acostumbrado a decirles, pero me sumo a la malta para bajarlo. Estos no llevan harina, pero si quieres hacer los mexicanos, por aquí en el blog tengo una receta de lo más rica, querida. Ojalá encuentres el maíz adecuado. May I please have this recipe in English. Thank you. We continue in season of maize. After the pastas and the cream, it could not stop preparing a few Cuban tamales in these days. They can be done by meat, but these are vegetarian. In my book, Vero’s Cuban kitchen, the recipe is of tamales prepared with masses of pork. To make them like that, only you have to add a few fried masses of pork to the maize already ground and mixed with the Creole sauce before arming the tamales. Also you can do them with hash. In this case, instead of the Creole sauce, you prepare the hash with the recipe that appears here. Though the tamales can be elaborated by an alone person, traditionally it prepares itself in family to lighten the task. One peels the maize, other one cleans it and other one grates or grinds it, while the meat is cooked or becomes the slightly fried one. Once it lists the mass, the tasks divide in doing the bolsitas and to refill them, and in covering them and to tie them with the kitchen cord. Me bring so much recollections of my childhood this plate! If you buy ground maize, you will save a lot of work. Eye, that the maize used for the Cuban tamales cannot be a sweet and must be tender. If it is not tender, the grains are left in soaking during a couple of hours before grinding them. And if the mass is dry, one adds little milk. If you use dry leaves of maize, which can be obtained in almost all the markets, dip them during 30-45 minutes, drain them and dry them with a cloth before beginning to refill them. This recipe gives for 15 tamales. I am charmed with to sting (tapear) and also with boiled rice acabadito of doing. Preparation Prepares the Creole sauce in a medium casserole. For it, it warms the oil, poaches the pepper and the onion, adds the garlics and the tomato, sautés 2 minutes and adds the rest of the ingredients for the sauce. He cooks during 10-12 minutes to average fire until the water evaporates. Withdraw it from the burner and leave her to refresh approximately 15 minutes. Mix it with the ground maize. It rectifies the salt. 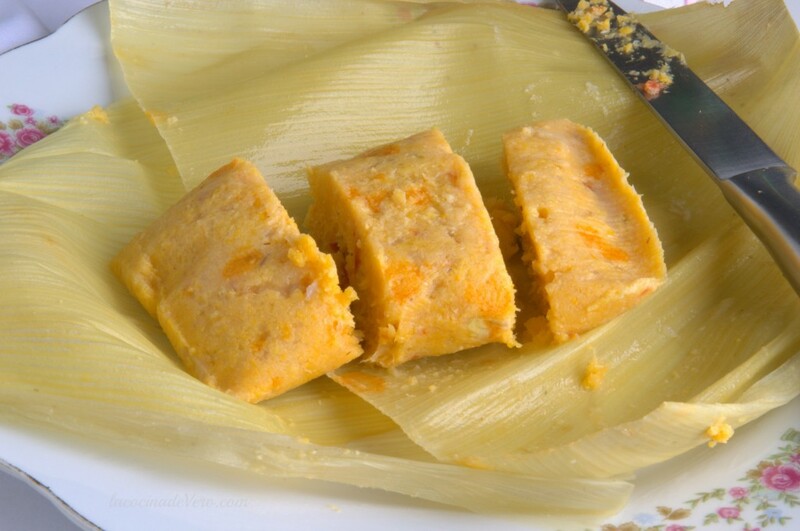 To arm a tamal is a species of bolsita, coiling a big leaf of maize in the shape of cone. The broadest part will form the mouth of the bolsita, whereas you must fold the narrow one up, more or less for the half of the cone, in order that the fold forms the bottom of the bag. You hold her with a hand and with another hand, throw in her a few spoonfuls of the mass, without filling it too much. To close the tamal, it coils the bolsita with another ready leaf inversely, using then, to double it, the same already explained procedure. Finally, you tie the tamal with kitchen thread, making sure yourself that should not be opened, but carefully of not breaking the leaves. Once tied the bolsita, you her rest on some container or site that allows to place it in vertical position, with the mouth up, the mass is not going to be spilt. It repeats the process with the rest of the mass and the leaves. Set to boil abundant water in a big casserole and add a spoonful of salt. He throws the tamales and cook to fire way – high place, between 45 minutes and 1 hour. He withdraws the leaves in the moment to serve them and they put piquant sauce or kétchup above. Que rico me acuerdo cuando estaba en Cuba yo los hacia eso es mi favorita comida pero ya no los puedo hacer aqui en Boston no hay el maiz para poderlo hacer gracias por recordarme tan Rica Receta!!! Es que el maíz es diferente aquí. Ven a Miami para que vuelvas a comer tameles 🙂 Saludos. No he probado hacerlos así. Cuéntame que tal. He hecho tamales mexicanos solo con cornmeal y me gustan mucho también. El maiz molido es maiz fresco que desgranas? Y despues lo mueles donde? En la licuadora (Osterizer)? O usas paquetes de maiz congelado?? Puede ser maíz fresco desgranado y molido en una máquina de moler o en un procesdor de alimentos. No he probado la batidora o licuadora, pero seguro con cuidado se puede. Es trabajoso pero vale la pena tenerlo fresco. Aunque yo tengo la suerte de conseguirlo congelado en un ranchón cerca de casa y ya lo venden molido y todo. Me ahorra bastante tiempo. Donde se encuentra maize molido. Es frizado o Seco en grano. Como se llama en ingles? Lo compro en Miami en ranchos en el área de Homestead. No sé cómo se llama en inglés puesto que acá no lo he visto fuera de los sitios que lo cultivan. 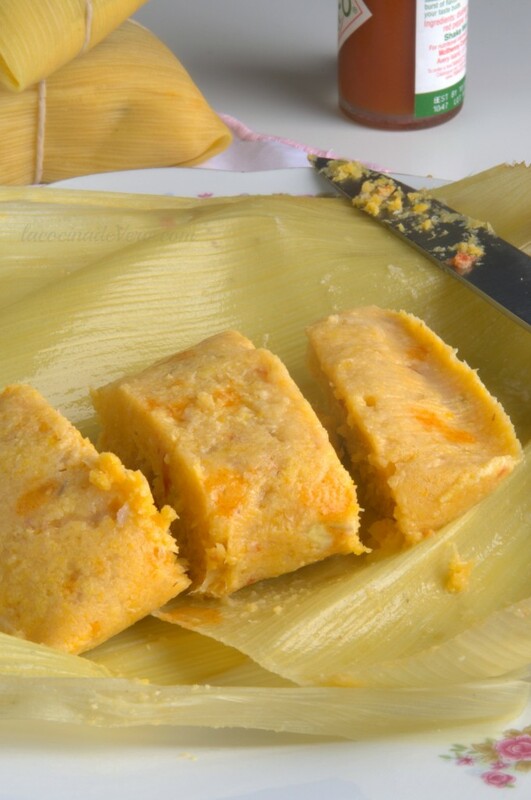 El maíz americano es lo que venden en otros sitios y desgraciadamente no sirve para hacer estos tamales pues es una variedad muy dulce.